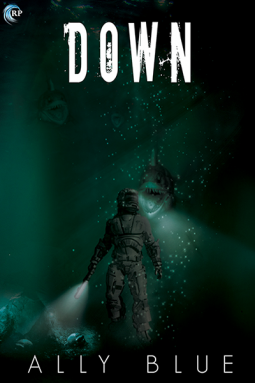 Down is my first Ally Blue novel and I'm now a fan. I will definitely read more. Down takes us deep, very deep, to a place where sunlight is no more than a memory and the ocean pressure will crush a person beyond recognition. For the men and women of BathyTech, however, much more waits. I like Armin and Mo very much, particularly together. Theirs is a story of romance under pressure. I also really liked that in addition to excellent suspense and tension pulling me through scenes, we also see so many things only by discovering the aftermath. I found this well done particularly since in many cases the unknown action is so much more scary than if the action had been laid out. We don't know who did it or how but it was bad and frightening. The whole sense of being trapped deep below the surface added even more delicious scariness. The author is subtle about it, which I really enjoyed. The characters don't fear living underwater, they don't fear the ocean. They come to fear the people they live with, however, and for me setting the action underwater gave a whole other layer of creepy. Definitely recommended to anyone who likes the feel of movies like Leviathan and Event Horizon. I received a copy from Riptide Publishing via Netgalley in exchange for my honest review.